This website is owned by the Government of Trinidad and Tobago. It was created and is being continuously updated and managed by the Law Revision Commission which falls under the purview of the Ministry of the Attorney General and Legal Affairs. 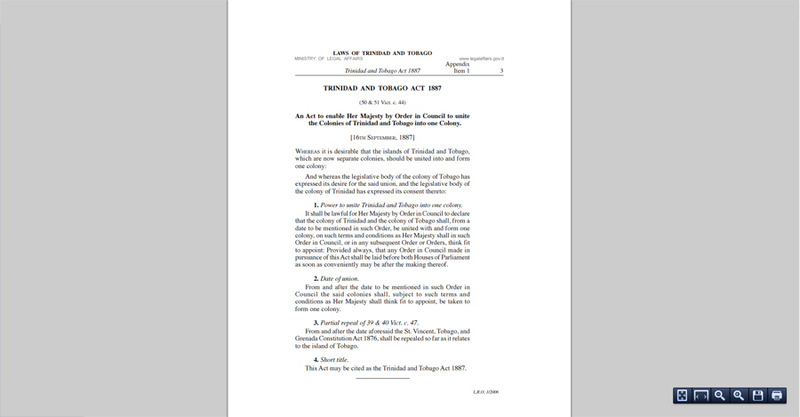 It is an attempt to preserve the legislative history of Trinidad and Tobago. Failure to preserve the various volumes of laws, in particular the old Ordinances enacted since the colonial era would eventually result in the loss of these scarce but invaluable documents as hard copies are deteriorating rapidly and becoming almost impossible to scan and preserve. It is also intended to be an invaluable research tool for legal practitioners, Judges, Parliamentarians, historians and the general public by offering free online access to the unofficial versions of the law dating back as far as 1838. 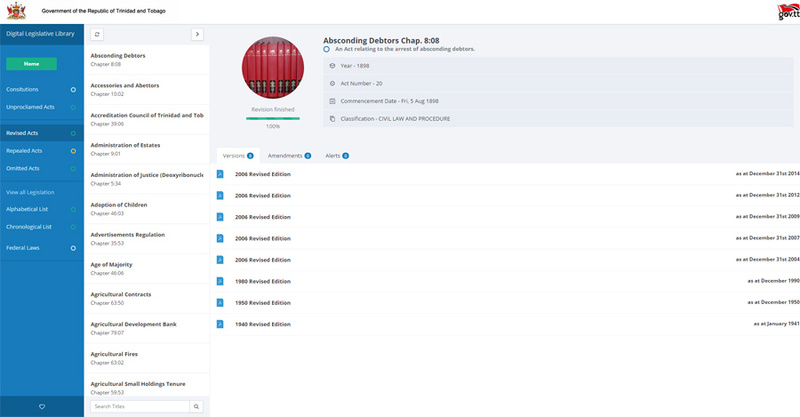 This site enables not only point-in-time searching which allows the law to be viewed at specified times in consolidated form but also gives access to the amending legislation which would have altered the laws over time. 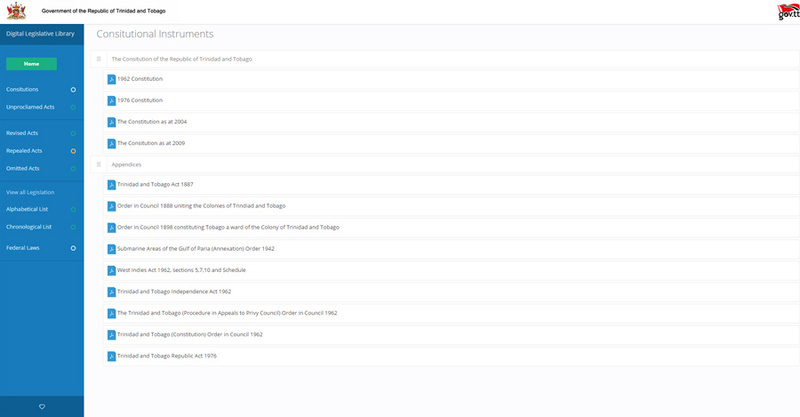 An interesting and notable feature of the site is that it includes those available volumes of the Federal Laws which would have been applicable to Trinidad and Tobago during the years of the West Indian Federation. The website is built with the purpose of managing and preserving pieces of legislation from past, present and future while making the laws accessible to users. A number of flat user interface components with a clean style that are fully responsive and puts mobile devices first, are used in the design. It was intended that the laws be accessible on all forms of mobile and desktop devices everywhere. This database offers point in time searching and uses modern XHTML technologies to cross-reference and provide amendment history to associated pieces of legislation. This site uses Adobe Portable Document Format (PDF) documents. You can convert PDF documents to text using Adobe’s PDF web-based conversion service. As a result of the technologies used, it is expected that the project will enable the Commission to successfully achieve its goal of providing real-time access to the Laws of Trinidad and Tobago. All Acts and Subsidiary Legislation from 1962 to 2019 are available on this site together with most of the pre-Independence primary legislation. Those few volumes which are missing are not available at this time. The Commission will, however, continue to search for the hard copies of those old editions and update the site as time goes on. Subsidiary or subordinate legislation including Rules, Regulations, Orders, Proclamations, Notices, etc. Acts omitted from the revised versions – such as private Acts, financial legislation, incorporations, etc. This website offers free online access to the unofficial versions of the law. Until now, the only official version is the revised laws consolidated and printed by the Law Revision Commission. The Commission does not guarantee that all references are correct nor can the Commission give access to every single law that has been enacted as many of the old Ordinances are not available.